The results of Consulting Engineers South Africa's (CESA) bi-annual Economic and Capacity Survey for the period January to June 2012 just released indicate that the industry is not firing on all cylinders while they eagerly await Government's planned Infrastructure Programme rollout. Government is not spending and although there appears to be a lot of planning taking place the physical manifestation is just not happening. Consequently many firms are looking north for work across our borders. Procurement standardisation, Public Private Partnerships, Maintenance and Quality Management all remain challenges for the industry. 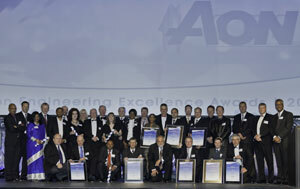 Consulting Engineers South Africa’s (CESA) prestigious CESA Aon Engineering Excellence Awards held at Vodacom World in Midrand on the 15th August this year are a celebration of innovation, quality, outstanding workmanship and professionalism in the industry. CESA is proud to host this annual event, sponsored by Aon, as a platform to showcase the important role that infrastructure plays in the sustainable development of our country. The Awards focus on consulting engineers and their clients who participate in or initiate projects that promote the advancement of our nation and the people of the continent. 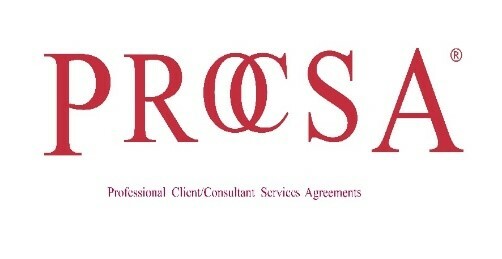 Consulting Engineers South Africa (CESA) is appalled at Governments poor performance in relation to the non payment of suppliers resulting in many companies in the industry going into liquidation and out of business. Just recently Sanyati Holdings has been forced into provisional liquidation due to Government incompetence in not paying timeously. Graham Pirie, CEO states, "If Government wants to create jobs then this is very poor behaviour". Key priorities included in President Zuma's New Growth Path are job creation and improved service delivery. Non-payment is having a serious impact on SA's ability to deliver infrastructure. Consulting Engineers South Africa (CESA) is appalled at Governments poor performance in relation to the non-payment of suppliers resulting in many companies in the industry going into liquidation and out of business. Just recently Sanyati Holdings has been forced into provisional liquidation due to Government incompetence in not paying timeously. Graham Pirie, CEO states, “If Government wants to create jobs then this is very poor behaviour”. Key priorities included in President Zuma’s New Growth Path are job creation and improved service delivery. Non-payment is having a serious impact on SA’s ability to deliver infrastructure. Consulting Engineers South Africa (CESA) has reiterated the need for Government to get its house in order. The lack of infrastructure development due to projects not being undertaken as well as tender processes taking up to 3 years to materialise is, say CESA, in large part due to the lack of leadership within the government organisations. Consulting Engineers South Africa (CESA) has a proud history of being at the forefront of driving positive change in the industry. 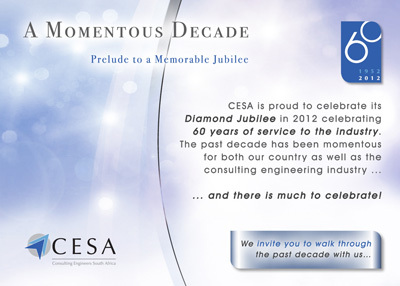 Having been founded in 1952 CESA is proud to celebrate its Diamond Jubilee in 2012 celebrating 60 years of service to the industry.....and there is much to celebrate. Consulting Engineers South Africa's (CESA) new President Naren Bhojaram, presented his presidential message and theme for the year at a function held in Johannesburg. With a theme of ‘CESA Engineers – Unquestionably Ethical’, Bhojaram addressed the global issues impacting the industry; the state of the Consulting Sector; the Procurement Environment; and delivery models to enhance job creation with a strong emphasis on Business Integrity and the eradication of corruption. He also addressed the ‘one thing we can all do to grow our economy’. 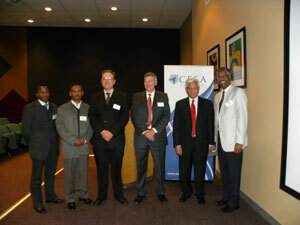 Tafadzwa Mukwena (Chairman, CESA YPF Gauteng North Branch); Sugen Pillay (CESA Gauteng South Chairman); Andre van der Walt (CESA Gauteng North Chairman); Graham Pirie (CESA CEO); Nazir Alli ( Guest Speaker and SANRAL CEO); Naren Bhojaram (CESA President).